AL Haymon, one of boxing’s most high-profile movers and shakers is advisor, manager or both to almost 200 fighters, but one who prefers to shun the limelight and operate from the shadows. Instead, the face of his operation falls to his long-time friend, Sam Watson who is recognisable in the ring and in the background of post-fight interviews of Haymon’s fighters along with his sons, Brandon and Marcus who are jokingly referred to as boxing’s biggest ‘photobombers’. But the Watsons aren’t just there to get their faces on TV, they are there to create something of a family environment and represent Haymon who is treated with reverence by his fighters and suspicion by his rivals. On January 28, two of those fighters will go toe-to-toe at the MGM Grand Garden Arena in Las Vegas, Nevada – Carl Frampton, who hooked up with Haymon in the summer of 2015 and Leo Santa Cruz whose relationship with ‘the ghost of boxing’ goes back a little farther. Unsurprisingly, Haymon was not in Belfast to attend the press conferences ahead of the WBA featherweight title rematch but his right-hand-man Watson was and he is predicting fireworks to resume when the bell goes to signal the start of the 13th round between these leading lights of the 126lb division. “A lot of these rounds are going to be close too. That won’t change, it’s going to be another great fight,” he said. Certainly, the first meeting between the pair at the Barclays Centre in Brooklyn back in July was an epic occasion although Frampton will have much fonder memories than Santa Cruz who relinquished his title and suffered the first loss of his pro career. “It hurt him a lot. He had never lost,” Watson said of Santa Cruz. “I’ve no doubt there were tears because he is not used to losing. He had a draw a long time ago, but since then it’s all been wins – he’s a winner. “Frampton is a winner too, so it’s fantastic. This fight is going to be the first major fight of 2017. It’s going to be history. “They’ve already had one fight and they going to fight better and stronger. Watson was blown away by the reaction of the Belfast public at that November press conference at the Europa Hotel and said it whets the appetite for what is sure to be a massive occasion at the MGM Grand. “It’s a fantastic crowd,” he said of the Belfast fight fans. While some major fights tend to flatter to deceive, the first meeting between Frampton and Santa Cruz most certainly lived up to expectation. Santa Cruz did have a disrupted preparation due to his father and head trainer, Jose being diagnosed with cancer, but the Mexican has promised an improved and focussed display this time around while Frampton will undoubtedly feel more comfortable in his second fight at featherweight. “That first one did (live up to expectation) and the second one will too,” predicts Watson. “Leo had never lost and was worried about his father with cancer, but it was a great fight although he knows he can fight a little better, but Frampton can fight a little better too so it’s going to be one of the biggest fights of the year. While bigger is good, the objective for both men will be to prove who is better. Both men conduct themselves with unparalleled grace outside the ring, but with ferocious hunger inside it and neither will be happy to leave the ring without the title on the night. “If you can beat Leo Santa Cruz twice, that makes a big difference to your career,” insisted Watson. 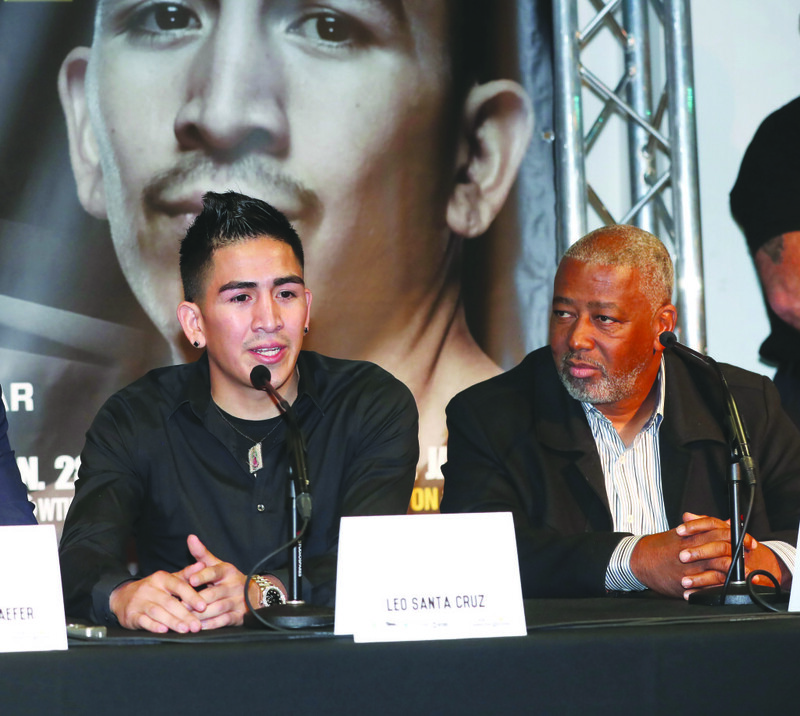 “Beating Leo Santa Cruz twice is big because he’s a tough, Mexican fighter. “He loves the people, he loves everybody, will sign anything and take pictures with everybody – he’s a real nice guy.